On 12.08.2010, Hector Rail made public that they had acquired a ES64U2 lcomotive of MRCE Dispolok. And that they took an option for four more. Hector Rail got the oldest locomotive in the MRCE Dispolok fleet, unit 031. It was the first ES64U2 delivered to Siemens Dispolok in the yellow and silver Dispolok livery, back in August 2000. The 242.001 returned to Germany at the end of 2010, where it was renumbered as 182.531. Then it was used for freight service in Germany. On 13.12.2010 Hector Rail published the news they call for a second ES64U2 locomotive of MRCE Dispolok. Since that month, unit ES 64 U2-003 became property of Hector Rail, after the 031 the oldest one in the MRCE Dispolok fleet that did not get the new black livery yet. Soon after the 003, also ES 64 U2-016 was sold to Hector Rail. On 05.05.2011, the 017 was the fourth one. 2017-08-24 [DE] Good luck Flix-Leo-Locomore! Update 2: Hector Rail has published officially that the company will again be the traction provider for Leo Express passenger railway transportation operating between Berlin and Stuttgart. "The commercial traffic is due to start 24th August. Initially the trains will run 4 round trips per week, Thursday afternoon to Monday morning. Leo Express is responsible for the promotion of the trains and the marketing is supported by Flixbus. Flixbus is the biggest private coach operator in central Europe. Leo Express will provide the conductor and service staff and Hector Rail the locomotive and drivers." 2016-12-14 [DE] Good luck Locomore! Today is the first day of revenue earning services for the new German open access long-passenger operator Locomore. It offers a new train service from Stuttgart to Berlin and back, one trip in each direction a day. It is using retrofitted Bm235 series coaches (360 degrees interior view!) which are being pulled by Hector Rail locomotives. The train is crowd-funded, a first in the world. We wish Locomore good luck! Live updates via Locomore's twitter account. Tobias Schubbert caught a Locomore test train today. Two orange coaches pulled by Hector Rail 242.517 in Jena Göschwitz. The new open access, long-haul passenger operator in Germany, will commence with its train services on 14.12.2016. On November 15, EQT Infrastructure II announced that it had completed the acquisition of GB Railfreight from Groupe EuroTunnel through an indirectly owned company within the Hector Rail group. Founded in 1999 by the current CEO John Smith, GB Railfreight is the third largest rail freight operator in the UK, and provides a wide range of rail transport solutions and rail services. During the night of 21-22 March Hector Rail operated a test train with a speed of 235.8 km/h on behalf of Bane Danmark (Danish Infrastructure Authority). This is a high speed record for trains in Denmark. Hector Rail was acting as operator and provided locomotives and drivers for the tests. The tests took place at the Great Belt Bridge. It is Hector Rail's ambition to constantly take the railway to new levels and this is a good example to visualize this ambition. The locomotive used in the tests is a so-called "Taurus locomotive". These locomotives were built and approved for 230 km/h. Hector Rail has seven such locomotives in its fleet. They look entirely different now, but these locomotives have the same roots. Once they were both part of the Siemens (later MRCE) Dispolok leasing fleet. ES 64 U2-002 was sold to Hector Rail and is now the 242 502. ES 64 U2-006 was acquired by DB Systemtechnik and now hauls various DB test trains through Germany. Lately the machines were in action together at the German-Danish border for testing the catenary. A picture from the test train in Padborg by Andreas Staal. Hector Rail has since its inception in 2004 established itself as a powerful player in the rail market. With a strong customer focus, the business has grown to produce six million train kilometers annually. During the same time Hector Rail has invested over SEK 800 million (approximately EUR 90 million) in the loco fleet consisting of approximately 50 line haul locomotives. EQT Infrastructure II now enters as new majority owner of the company. EQT's ownership strengthens Hector Rail further and lays the foundation for further expansion and growth. Hector Rail operates trains in Sweden, Norway, Denmark and Germany. Hector Rail's customers are large industrial and transport companies. For these customers cost-effectiveness and quality are crucial criteria when selecting transportation partners. Financial stability and sustainability are also of fundamental importance. Together with EQT Hector Rail will be able to continue developing the attractive offering in the rail market. The change in ownership is highly beneficial for Hector Rail’s continued expansion. The transaction is expected to close during the fourth quarter of 2014 after customary anti-trust approvals. In March, we brought you the news about Hector Rail, expanding its fleet with two additional ES 64 U2 type locomotives. Three Hector Rail 242s are currently allocated in Sweden (503, 531 and 532) hauling Veolia passenger trains for example. 242.502, 516 and 517 are being used for freight transport in Germany. ES 64 U2-002 is no more, long live Hector Rail 242.502. Yesterday the freshly repainted locomotive, with nick name 'Zurg', left Linz in Austria, heading for Germany. Hector Rail buys 42 passenger coaches for 200 km/h: Since 2007 Hector Rail provides traction for passenger trains in Sweden. Hector Rail has in recent years invested in seven locomotives approved for up to 230 km/h. More and more service providers are exploring opportunities in the fully liberalized Swedish rail passenger market. Hector Rail has decided to extend its offering from traction only to whole train sets approved for 200 km/h. Used coaches purchased in Holland can be upgraded according to a service provider’s requirements. Hector Rail will not enter the rail passenger market itself. The intention is to offer a complete train system to a service provider who is interested in not only creating a cost-effective, but also a fast and comfortable travel market offering. The technical standard and interior can be adapted on the targeted passenger market segments. Railcolor: The coaches mentioned must be the former Bm235's of the German railways. From 2001 until 2009 they were used as type ICK by the Dutch railways, at that moment suffering from rolling stock shortage. For this purpose 150 coaches were bought and rebuilt. Most of these coaches are currently parked at Nijmegen (NL). In the past weeks, the former ES 64 U2-017, has been repainted in the workshops of Linz (AT). The image shows the machine in its new Hector Rail livery, with service number 242.517 and its new name: Fitzgerald. - RTC ES 64 F4-007 has been repainted in the blue zebra-livery in Kassel. - Captrain 185 550 now has the Captrain livery too. - New logos for the LTE EuroRunner locomotives. Yesterday, the former ES 64 U2-032 left the workshops of Linz. Today it arrived in Germany, tomorrow it will continue its journey to Sweden. It is the third ES 64 U2-locomotive for Hector Rail to get the full Swedish package. It arrived in Linz for its refit in November 2011. The black livery has been replaced by the orange and grey of Hector. Its new service number is 242.532. It has a new nickname: Lightyear. Hector Rail owns five 242 series locomotives, all bought from leasing company MRCE. 242.503, 531 and 532 will be used in Sweden. 242 516 and 517 will not get the Sweden-package (for now) and willbe used in Germany. Last June, the work shops of Linz outshopped Hector Rail 242.503 'Balboa' after an extensive refurbishment. That engine was the first ready for services in Sweden. 182.531 'LaMotta' is now in Linz. Siemens 21415, soon to be delivered to the WLC, and the very last ES64U4 so it seems, is also in Linz. It is painted in green and white. It will get a promotional livery for Hödlmayr. The same Bahnforum.info show OBB 1116 153 in black, soon to promote the musical CATS. At this moment, MRCE Dispolok has officially sold four ES 64 U2 series locomotives to Swedish operator Hector Rail. Number five is soon to come. The future 242 series locomotives are in various stages of rebranding and refitting for their new owner. 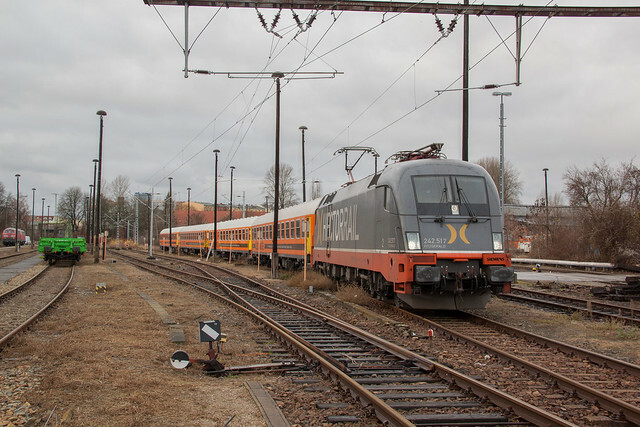 Last week Hector Rail published the news that it has been contracted by Veolia to haul their Stockholm and Malmö-services (and some special trains winter resort areas in Northern Sweden) for the next five years. Hector Rail also states that it will provide locomotives with a vmax of 200 kph from this fall. This link goes to the website of Hector Rail, operator from Sweden. They have acquired one ES64U2 from MRCE Dispolok, with an option for four more. On 16.08.2010 already, homologation runs will have to start. MRCE plans on selling the ES 64 U2-031 to Hector Rail, which is indeed 10 years old, as said in the press statement. In fact, it's the oldest locomotive in the MRCE Dispolok fleet. It was the first ES64U2 delivered to Siemens Dispolok in the yellow and silver Dispolok livery, back in August 2000.